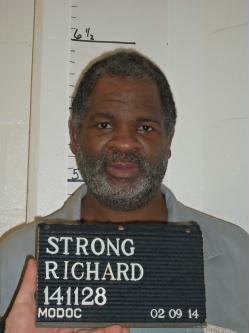 Richard Strong was executed by the state of Missouri on June 9, 2015. Richard was pronounced dead at 6:58 pm CDT, inside the execution chamber at the Eastern Reception, Diagnostic, and Corrections Center in Bonne Terre, Missouri. Richard was 48 years of age. Richard was executed for the double murder of his girlfriend Eva Washington, and her two-year-old daughter Zandrea Thomas, on October 23, 2000, in St. Louis County, Missouri. Richard spent the last 12 years of his life on Missouri’s death row. Richard alleged that he had an impoverished childhood filled with neglect, violence, and abuse. Richard was abandoned by his father and allegedly suffered from seizures, disorganized attachment, and mental impairment. At 3:30 pm, on October 23, 2000, the St. Ann police dispatch received a phone call that was disconnected almost immediately. Upon replaying the call, the dispatcher heard a woman scream. The dispatcher attempted to redial the number repeatedly until police arrived several minutes later. The call came from the home of Eva Washington and her two daughters: two-year-old Zandrea Thomas and a three-month-old who was fathered by Richard Strong. When police knocked, they received no immediate answer at either the front or back door. Strong eventually opened the back door and stepped outside, closing the door behind him. He told police that Eva and the children were sleeping. He later said Eva had gone to work. When police asked to see the children, Strong claimed to have locked himself out and knocked on the door, calling for someone to open it. The bodies of Eva and Zandrea were found in a bedroom. Each had multiple stab wounds. The three-month-old child was not injured. Strong was convicted on two counts of first-degree murder and sentenced to death on May 9, 2003. Please pray for peace and healing for the family of Eva and Zandrea. Please pray for strength for the family or Richard Strong.